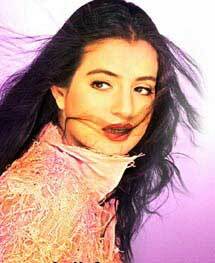 Petite and pretty Amisha Patel is as unfilmi as they come. The grand daughter of famous lawyer Rajni Patel, Amisha aced her way through academics winning a gold medal in economics at Tufts university before the acting bug bit and she catapulted to fame with the huge blockbuster Kaho na Pyar Hai with Hritik Roshan. While there were whispers that it was Hritik who was the showstopper in the film, and Amisha rested on his laurels, she silenced critics by her mind-blowing performance as Sakina in Gadar: Ek Prem Katha. Not only did she look breathtakingly beautiful sans makeup, she carried the very tough role with grace, dignity and sensitivity. The movie ruffled political and religious feathers but went on to become one of the biggest hits in Bollywood cinema. Amisha’s mother Asha Patel could probably herself give quite a few bollywood actresses a run for their money. Born and raised in London, the only sister among five brothers, Asha is perhaps even more beautiful and doesn’t look like a mother of two kids in their twenties. Asha Patel says she grew up in an elite pampered atmosphere abroad and met her husband as a teenager while visiting India. For him it was love at first sight, but Asha laughs and says as a Sindhi Punjabi she was not sure that she would fit into a Gujarati family. Today not only has she made a success of a marriage she ventured into at 19, she is with and behind Amisha, every step of the way to help her fulfill her creative potential. In an exclusive with Little India, both mother and daughter talk about what it takes to make it work in a world that is so alien to what they grew up in. Academics to Acting-quite a switch from being cerebral to being on celluloid! How did that happen? Asha: Yes Amisha was always an honors student throughout and then went to Tufts University to study bio-genetics, but later switched in her 3rd year to economics. Bio-genetics did not really have much scope in those years in India. Even before she left, Rakesh Roshan who is a family friend, had been telling my husband “let me launch your daughter.” Feroz Khan’s daughter Leila also used to call me and say Asha can you get Amisha back so we can launch her with my brother Fardeen in his debut film. I said, No way, let her graduate. Besides, I do not think she belongs in the film industry. Little was I to know! Amisha: Yes, I was always academically inclined, but I had learnt bharatnatyam, acted in and choreographed plays while in school. I was also very fascinated by biology and genetics, DNA, chromosome decoding etc and decided to study biogenetics at Tufts. I did realize midway that not only would this require years of studying and then research, there was also no future in India and that coming from a family which had academics and business as its background, majoring in economics was a better choice. I was very pleasantly surprised by the education system here. In India, all you are taught to do is mug, mug, and mug and spit it all out on the day of the exam. Here they teach you to think for yourself, bring new thoughts, new ideas to the table, even if it goes against what they have been teaching. Subhash Chandra Bose’s grand son was my professor in a lot of my political and international relations classes and as a result I had a first hand information to the freedom struggle and how when Subash Chandra Bose and his colleagues escaped he was a young lad driving the getaway vehicle. I had not learnt about India and India’s freedom struggle in India, the way he taught me at Tufts. Being exposed to such a multi cultural environment was so mentally and intellectually stimulating; it really helped me grow in so many different ways. I learnt so much about other cultures and in turn taught them about Indian culture. Asha: Amisha would bring people to India, including her old professor to give them a first hand view of her country. She is very passionate about India and never ever thought about settling down here. What myths did you shatter about India and Indians? Amisha: It was interesting that people thought I was from an Indian tribe and asked how I came to USA. I told them it was on a flying carpet and some of them swallowed that. To others I said I rowed all the way by myself in a boat and they swallowed that as well. They would say things like, do you really have toilet paper? Don’t you just dig holes and cover it up afterwards? I once took an America friend to India and we were waiting at Delhi airport to catch a connecting flight to Bombay, when she said oh is the Bangkok Palace here? I said no it is in Bangkok, which is in Thailand. Some of them even thought Texas was a nomadic land. When they have such little knowledge about their own states, I should not have been surprised by their ignorance about India. I started various religious and cultural festivities like Holi and Diwali. I taught Bharatnatyam, Hindi to some foreign students and at the end of it made them watch Dilwale Dulhania Le Jayenge and they could actually comprehend a lot of it. I also stopped at various points to explain what certain rituals meant in the film. I also took back a model based on Indian architecture back to USA depicting a mosque, a temple, and India’s caste system, and among three papers, I had to submit on religion I went and asked my professor if I could present one of them in dance form. I am a big fan of Jagjit Singh and there is a ghazal titled “Sar Jhukaoge toh pathar devta ho jayega( If you lower your head in prayer, stone will turn into God) and I choreographed, translated each line and danced to the song. Not only did I get a straight A, my professor invited me frequently as a guest lecturer to perform the same dance. I was so happy to be able to share that aspect of my culture with others. So after such a brilliant academic career, you returned to India, and worked in a firm and with your father. Was the acting bug simmering underneath? Asha: It was Subash Chandra’s Bose’s grandson who saw one of her dance performances and said what are you doing in academics? You should go home and give Madhuri Dixit a run for her money? Amisha would also perform for Jagjit Singh during his concerts in the USA, before 4-5000 people. He is so fond of her and every time his new CD comes out the first copy is always autographed and sent to her. She was so passionate about her dance, the plays she put up that I told my husband I wouldn’t be surprised if she returns from USA and tells you she wants to be in films. He was aghast and said you are crazy, to even think like that. She is such a brilliant girl. How can she ever think of being in films? Amisha: It is true that my professor told me to get into films , but I never took it seriously. I knew I would have to get back and do something academically or intellectually oriented, but at a subconscious level, I knew I liked the creativity, the performing arts, the lime light and being on stage.When I did tell my folks all hell broke loose! Asha: It was tough, even my son who was at UTA studying business and finance, called and said how you could even think of letting her act in films. Amisha said mom it will be only one film. I guess moms usually give in first and I did too. Since Rakesh Roshan and his wife were close friends I felt very comfortable. Amisha even stayed at their house often while shooting for the film. When I did finally see her on screen the first time, I was in tears and I still tear up. Of course, now my son is also going to act in films and when I reminded him of his comments to Amisha, he said nonchalantly, oh, I am a guy!I can do whatever I want!! Amisha: Dad is very conservative to this day. He had a hard time with the scene where I roll in the hay with Sunny. He hates to see me in anything but saris and salwar kameez. As a child if I wore a skirt and a halter-top, he would get a scissor and cut the clothes to shreds! But I think he is a little more chilled out now! I know you signed Gadar before Kaho Na Pyar Hai. The latter, and all the other films you have done so far, must have been a cake walk compared to Gadar. You had quite a tough role, that of a Muslim girl, from an elite family, cocooned, mollycoddled and protected who falls in love with a much older, uneducated Jat. It was also set against the backdrop of the freedom movemen, the Hindu Muslim, riots, the India Pakistani sentiments. How did you prepare for Gadar? Amisha: I took my discipline of education and knowledge to it. I read up a lot on Islam, read parts of the Koran, went to a mosque to see how they prayed. All the scenes were tough. I had to play a young woman who had all the grace and softness that Muslim girls have. If you read the body language, you will notice that Muslim girls are softer and not loud or bold like North Indian girls can be. Yet I had to show that underlying steel that I was made of, to enable me to defy my father, and yet not be offensive. I had also to play a mother. In fact on the first day of the shooting we started with this very tough scene where Sakina, the character I play, discovers it is her father who has tampered with her husband’s visa. Sakina was a strong character who fought against an entire nation to preserve her love at a time when even marrying outside your community was a no, no. 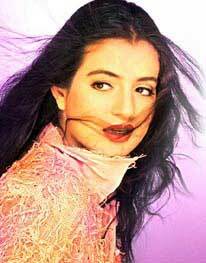 I was so obsessed with the character that Sakina became Amisha, Amisha became Sakina, and I could not tell them apart. There was a scene when after the riots I see my father’s watch and realize he is dead, I run out of the railway station crying. I was so into the character that once I started crying I couldn’t stop – two hours later I was still sobbing hysterically, the shooting came to a halt, and they had to keep giving me glucose and try to calm me down. For most of the emotional scenes, I didn’t use glycerin, the tears came naturally. Were you surprised at the political and religious furor over the film? Amisha: I was expecting it. People just need anything to talk about. There was nothing in the film to affect the religious sentiments. It was about the fight of a couple in love against an entire country that frowned upon that love. It was evident that all Sunny Deol wants is to be united with his wife. He never raises his hand on her father; in a usual Sunny film he would have thrashed the daylights out of the villain whoever it may have been. For a sardar whose entire family was brutally wiped out by the Muslims, to not raise his hands is to show that love conquers all hatred. I think frankly that you could read whatever you want to read into the film. Is it a story about love for your family, love for your country, a revolution. Eventually what seems to have touched the hearts of most people was the love story. Ironically, because a few people who were a case of sour grapes raved and ranted, it helped Gadar become the greatest hit in Bollywood, surpassing Lagaan and others, so I’m very grateful to all those people who whined! So what is next on the cards? Amisha: I am really excited about Zameer with Ajay Devgun. It’s about a spoilt motherless girl who falls in love with her college professor, and can’t take rejection. She creates some very negative situations as a result and ends up finally understanding and making a huge sacrifice. It is a wonderful role that has given me a wide scope to act. While I have really not learnt much from my directors I have learnt a lot about acting and life from the characters I have played and my costars, and through surviving in this industry. What has surprised you as you look back? Asha: That this is such a cutthroat place. We are not a filmy family. To this day, we have no idea how to promote Amisha. I have never had free trial shows of her films for my friends, like others. They think I’m stupid because I buy tickets and take them to see the movie in theaters. Even for these stage shows, I have gone to the box office and purchased tickets for my friends and relatives. I just cannot go and ask people for favors. I think she is still here because she works very very hard, is very conscientious and sincere. She has given two major hits in the south along with Kaho Na Pyaar Hai and Gadar.and it is because she is so conscientious and gives her best. Even in school till she graduated she had 100 percent attendance. Amisha: Yes, I was really stunned that there is so much hypocrisy, manipulation and double standards. I came into this industry with grand notions of creative cinema, fulfilling my potential as an actress and dancer. I realized very soon that at the end of the day it is just cutthroat business. A lot of time, the casting is done more out of network, or if the hero likes you or someone is having an affair. I have seen people walk away with films others deserved to be in or had been promised because of manipulations. I have survived because mom taught me there is a code of conduct one must always follow. She has said do your work with dignity and ethically. Morality and self-respect are things that money can’t buy. So I guess I am still living in Disneyland, but I think I am doing just fine.